The Calgary Trend House features a number of interesting and iconic design features that are signature elements of the Mid-Century Modern (MCM) architectural style. This style was characterized by things like clean lines, an emphasis on nature and bringing the natural world into the home, new building methods and technologies, and a celebration of the functional forms and components of the building itself. The post-war era provided a number of new materials, processes and techniques (many of them developed during the war) which allowed architects and designer to explore different ways of constructing buildings, and thinking about the space we live in. Not everything that was tried during this time was a success, but the incredible explosion of ideas at the time helped to shape the way we live and think about our homes to this day. Many of the features and elements of the Trend Houses are so familiar to a modern viewer, that it’s difficult to think of them as being as revolutionary in their time as they were. Many of these elements prevalent in the Trend Houses would not be seen in ‘mainstream’ domestic architecture until ten or even twenty years down the road. 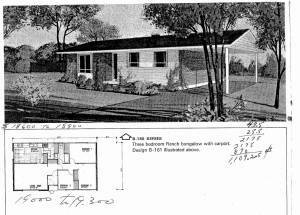 One of the things that the Calgary Trend House shares with a number of other Mid-Century Modern houses is that it has a very modest appearance from the street. Standing on the sidewalk in front of the house, the slope of the roof of the front part of the house matches a line drawn from eye height to the top of the gutters. Because of that, you can’t see the top of the roof or the back part of the house, so it seems like the house is as big as the front facade. Once you step into the house, you see the sloped roof and the true depth of the house and it is quite the revelation. One of the many unique features of the Calgary Trend House is the way that the architect chose to divide the spaces that are more public in nature (living room / dining room / kitchen / powder room) from the more private spaces (bedrooms / bathrooms / laundry room / playroom / utility room) in this case by creating two separate structures and connecting them via an enclosed breezeway of stairs. The single story front of the house contains all of the public spaces, including a powder room which was considered quite a luxury at the time. So the family could have guests over for a dinner party and they would never have to leave the main floor. The Calgary Trend House was also one of the very first examples of a split-level design, with the staircase representing the zone between the public and private parts of the house. Taking advantage of the sloping lot allowed Peter Rule to design a house where even in the lower play area, two walls of full size windows were possible. 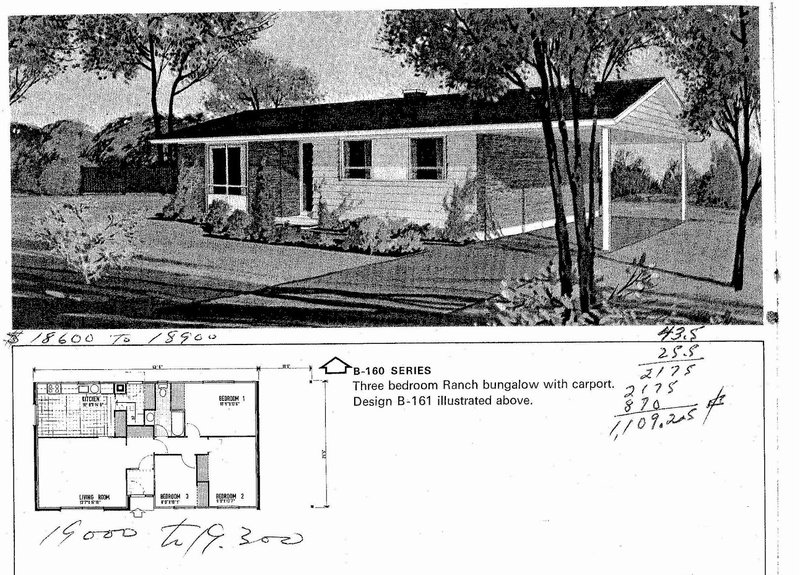 A typical bungalow of the day (and there are many examples still in the neighbourhood) follows a much different plan. Walking in the front door, on one side you had the living room at the front of the house with the dining room behind it facing the back yard. Next to the dining room, but closed off as much as possible was the kitchen which then led back out to the front entrance area. On the other side of the front door was a hallway with two bedrooms facing the front of the house, one bedroom facing the back of the house and a bathroom. Physically separating the public and private spaces in the way that the Trend House has, represented a huge departure from traditional thinking, and more closely reflects the idea of the “open living plan” idea that we are seeing as common place in architectural design today – 60+ years later. Creating a link from the inside to the outside is a hallmark of Mid-Century Modern design, and there are a couple of ways that Peter Rule’s design for the Calgary Trend House accomplished that. The first is by creating a wall that starts on the outside of the house by the front door and having it include the fireplace on the inside. Next to it at the front door is a full length glass panel to emphasize the transition from outside to inside. The other element is the wall of glass in the living room that looks out onto the side garden. While in more temperate locations this would be a literal wall of glass, in this house it’s a series of windows that provide a panoramic view into the back yard of the house, making the room feel much bigger than it is. Every room in the house has access to full size windows which makes it bright and airy at any time of day. 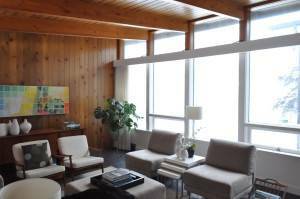 In the Mid-Century Modern style, the structural elements of a building were exposed to show how they fit together. The idea was to strip away any excess embellishment or decoration, and treat the architectural elements like something to be celebrated not hidden. The most obvious example of this in the Calgary Trend House is the roofing system in the public part of the house. Some of the first glue-lam beams were used to create a truss system which is visible from the interior and together with the cedar ceiling above it creates one of the most striking parts of the house. The beams cantilever outside the walls of the house by about 3 feet which further helps to underline the continuity between the inside and outside. Inside, the beams are used as a guide for the placement of interior walls and windows. Having these elements line up with the beams helps to emphasize the physical structure of the house quite clearly. 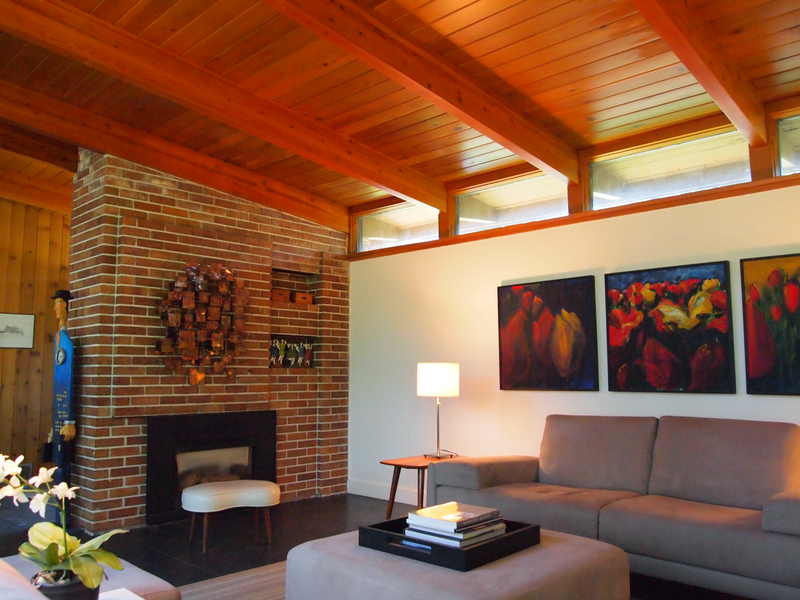 Additionally, this type of roof allows for windows that go all the way to the ceiling in the dining room and living room, as well as creating the perfect area for the clerestory windows so typical of MCM design. Another common feature of MCM design is the use of built-in furniture that is designed as part of the structure. In the Calgary Trend House, architect Peter Rule included a number of built-in elements to complement the house and built using Douglas Fir plywood which was one of the items they were promoting. 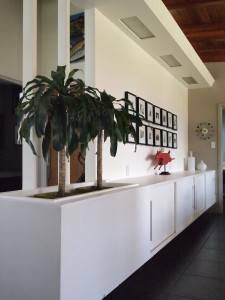 The most impressive of these elements is the sideboard / planter / lighting valence that lines the entry and dining room areas. Providing ample storage for dishes etc, it includes a valance over top of the sideboard into which a fluorescent lighting system was placed (since replaced with LED lighting). It also acted as a divide between the front entryway of the house and the breezeway that divides the public and private spaces, and acts as a discrete screen for the front closet and entry to the powder room. At the end nearest to the front door, a large zinc plant box was built into it, in order to bring some more natural elements into the space. Other built-ins in the house included a small desk and drawers in the second bedroom (removed – but will be recreated) and the closets and drawers in the dressing room. All of these were built according to the specifications of the architect and shared a very similar style in terms of drawer designs etc. One of the first things we noticed about living in the Calgary Trend House was that in the public area of the house (i.e. the front) that the architect had flipped all of the traditional elements of a typical bungalow of the time. For example, in a typical bungalow of the era, the living room would have a large window facing the front of the street which means you need to have some window dressing for privacy. In the Trend House, the large wall of glass in the loving room faces the private back yard, which is not only a way of bringing nature into the house but also increases privacy. Small clerestory windows on the opposite wall face the street and let in light continuously. Again in a typical 50s bungalow the the dining room is at the back of the house, but here it’s placed at the front of the house, and has large windows that go right to the ceiling. Not only does it let in a ton of light, but using the room you feel much more social as you’re not tucked away at the back of the house. Normally in the kitchen, the sink is positioned to look out the back of the house out to the yard, but in the Trend House, the architect designed the layout of the kitchen so that the sink faces out towards the street. The result is that your connection to the community and awareness of what’s going on in the neighbourhood is greatly increased. You quickly realize how much time you spend preparing food, cleaning dishes etc and being able to wave to people passing by etc makes it feel like a much more social space. In fact, one of the trends we’ve seen over the last few years is when remodelling a bungalow (and even in some new builds) the architect reconfigures the kitchen so that the sink faces out the front of the house. And the Trend House was there 60 years ago.